Works on the Epson R260, R270, R280, R290, T50,T60,Artisan 50 as well as some others. Way cheaper than thermal printers! The tray fits standard pvc cards. There are slots for 2 cards to be printed at the same time. Use this tray in place of you CD/DVD on these printers: Epson R260, R27, R280, R290, Artisan 50 as well as some others. If your CD/DVD tray measures 5 7/8th" wide by 9 5/8th inches long, it should work. There are slots for 2 cards to be printed at the same time. You can print any ID card you can imagine or create! Print ID cards for your company or organization. Way cheaper than thermal printers! 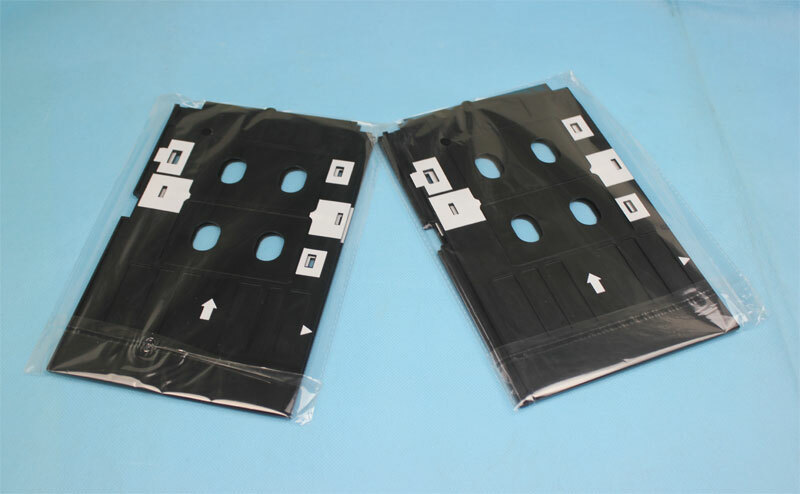 The tray fits standard pvc cards but make sure you only use special inkjet PVC cards. These are special blank cards made for Inkjet printing and make your ID's look great! See our other items to get these cards.